A druid leader who claims to be the incarnation of a legendary British king has suffered defeat in the latest legal skirmish of his long-running battle over the removal of ancient remains from Stonehenge. King Arthur Pendragon appeared at the high court in London to argue that the “royal” remains should be returned to their age-old resting place in Wiltshire. Pendragon, a 57-year-old former soldier and biker who changed his name by deed poll, wanted the high court to give permission for a judicial review of the government’s decision to allow the remains to be taken away for analysis. But Mr Justice Wyn Williams refused King Arthur, ruling there was insufficient evidence to show the Ministry of Justice (MoJ) had acted unreasonably. 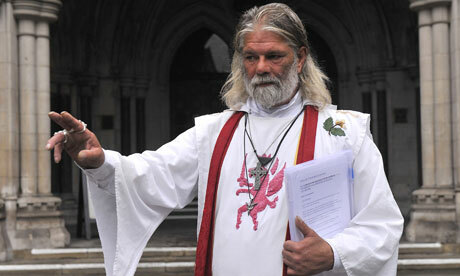 Outside court Pendragon, who styles himself as battle chieftain of the Council of British Druid Orders and “titular head and chosen chief” of the Loyal Arthurian Warband druid order, remained defiant. Wearing white flowing robes, he called for a day of action on Monday to draw attention to the cause. He said: “Even though on this occasion my appeal has been dismissed I am still very much hopeful that I can win in the future. “I wasn’t asking for the bones to be put back straight away, I simply wanted confirmation that they will be returned to the site as soon as possible.” He said druids felt the remains were “guardians” of the site. The judge heard that the cremated remains of more than 40 bodies – thought to be at least 5,000 years old – were removed from a burial site at Stonehenge in 2008 , with ministers giving researchers from Sheffield University permission to keep the bones until 2015. Pendragon, who represented himself, said the bones were remains of members of the “royal line” or “priest caste” who could have been the “founding fathers of this great nation”. He told the judge he feared the remains would never be returned, but moved to a museum, adding that the MoJ had “unreasonably” failed to take account of his views. The MoJ denied the allegation. Researchers say their work on the remains is yielding “fascinating insights” into the history of the site. After the decision English Heritage, which manages the site, said the scientists wanted to keep the remains until 2015 so full analysis could be carried out. “Otherwise we will lose an opportunity to learn more about this important site,” a spokesman added. A spokesperson for the University of Sheffield said: “Research on the cremated bones is beginning to yield fascinating insights about the people of Stonehenge. “Due to the large number of remains and the fact many of them were mixed together by archaeologists in the 1920s, study of them has been difficult and time consuming. However, we will now be able to apply new scientific techniques, developed only in the last few years, to find out more about who these people were.